My bicycle began as a 2001 Novara Randonee, but before bringing it home I had the friendly folks at REI customize it to fit some specific needs. A fairly consistent piece of advice I got in reading about fully loaded touring was that if I am going to use this bike to haul 60+ pounds of camping gear over the Appalachians and the Rockies, then I'm going to be appreciative of having some low gearing. The best way to accomplish this was to swap out the stock crankset with a one from Shimano's mountain bike group. Since bringing the bike home, I have made a handful of additions and modifications to the bike. The first batch was to handle the obvious problem of where do I put all the stuff I need to go on a fully loaded tour. These next things were to help make sure the tour goes safely, comfortably, and reliably. I'm planning on going West to East in June 2004. I'll be doing it 2 weeks a year as my vacation schedule won't allow me to do it all at once. I ride the same bike, 2001 Randonee, and have also made some changes. Would he interested in any comments you might have on the Oregon part of the route. In your opinion, how is McKenzie Pass coming from the west? Nick I have really enjoyed reading your travel journal. I discovered your web site when doing a search on "Novara Randonee". 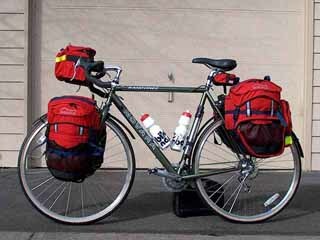 You see, I am also planning on an extended trip across the U.S. and have been trying to decide which bicycle to purchase for the trip. Right now I have an old S 12-S Fuji -- a nice bicycle, but not appropriate for such a journey. Anyway, I've been wondering where you have gone, and what you have done since your transamerica ride. I am positive I am not alone in wondering about this. So, please bring your fans up-to-date.